The UCI Health gala, "Healers & Heroes," raised a record $1.6 million to support cancer research and treatment, including more than $530,000 for an intraoperative radiation therapy device that has the potential to dramatically reduce breast cancer treatment and recovery times for many patients. More than 500 people attended the celebration of healers and heroes associated with Orange County’s only comprehensive cancer center, held April 26 at Disney’s Grand Californian Hotel & Spa in Anaheim. 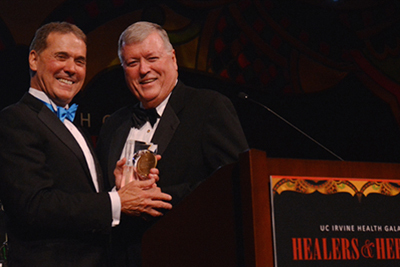 Belmont, the event’s host, presented the UCI Health CEO Leadership Award to Western National Group CEO Michael K. Hayde for his philanthropic support of pioneering cancer research and patient care. Jeralyn Glass, a longtime Hayde friend and internationally recognized soprano, performed a musical tribute to the honoree. Guests closed the evening with dancing to the music of JT & Friends – the band formed by UC Irvine philanthropist and drummer John Tu, co-founder of Kingston Technology. The intraoperative radiation therapy (IORT) device funded by the community will make the UCI Health the first cancer center in California to offer the Margin Probe intraoperative assessment tool in combination with IORT for the treatment of breast cancer. Margin Probe provides data on tissue surrounding a tumor to help a surgeon immediately assess whether all cancer cells were removed during surgery, with the goal of reducing the need for subsequent surgeries. The new IORT device will deliver radiation during surgery in a single, concentrated dose, often as an alternative to longer courses of post-surgery radiation. Jeff and Nancy Stack and David and Sandy Stone served as honorary co-chairs of the critically and financially successful gala. Major sponsors included Abbott Medical Optics, Arbonne International LLC, Allen and Lee Chao, Richard and June Chao, the Hsia family, and Mary and John Tu.